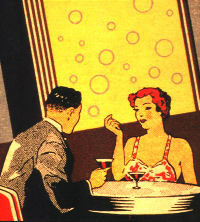 "The Sunday Mercury says that if you are at a hotel, and wish to call for a beverage compounded of brandy, sugar, absynthe, bitters and ice, called by the vulgar a cocktail, ask for une queue de chanticleer-it will be an evidence at once of your knowledge of French and of Chesterfield." Over a fairly short time, cocktails have evolved from simply being a mixed drink of questionable quality, into something that can often be considered culinary product that is produced with care and craftsmanship. There is still however a lot of knowledge and information regarding the cocktail which can be considered questionable at best. The Chanticleer Society is made up of a dedicated membership which wants to help further the cocktail by providing all who are interested with access to information and resources that will help them better appreciate cocktails in specific and its other mixed-drinks siblings in general. Please enjoy perusing through the pages you will find here, and hopefully the information you discover will help you along your quest. In the early days of this site, the information contained here will obviously be minimal, but will be increasing over time. At the moment, there aren't a lot of pages here (we're working on it), but if you'd like to see a list of all the pages available, you can see a list here. This page was last edited on 11 March 2019, at 16:42.